Guide to Tuli Block Botswana. Information about the Tuli Block Botswana, information on Tuli Block including fuel, food and communication details and hotels, camp sites, lodges and places to stay in and around Tuli Block Botswana. The Tuli block is an area of outstanding natural beauty with majestic rocks, strange vegetation, abundant wildlife, a profusion of birds and a rich archaeological heritage on Botswana's south-eastern border with South Africa. 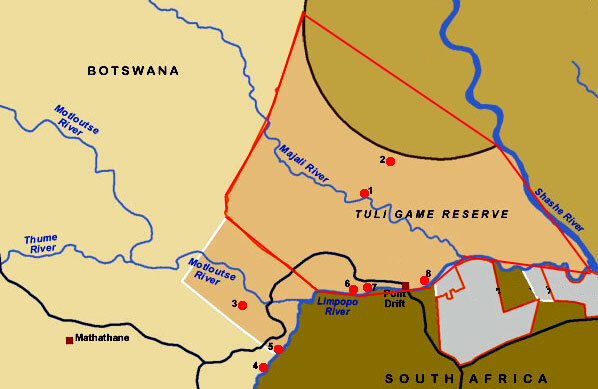 The Northern Tuli Game Reserve, on the confluence of the Limpopo and the Shashe rivers, in the easternmost corner of Botswana, is the collective name for several privately-owned game reserves including the Mashatu, Ntani and Tuli Game Reserves, all north of the Limpopo River, consisting of game reserves, hunting and conservation concessions covers up to 300,000 ha which is the largest privately-owned game conservation area in southern Africa. Much of the area is unfenced, allowing the animals to roam freely between the Motloutse and Limpopo rivers. Apart form elephants visitors can follow the trails of lions, leopards, elephants, giraffes, spotted hyenas, bat eared foxes, aardwolves, cheetahs, kudu, Burchell's zebras, bushbuck and baboons. Spotlight-assisted night drives may reveal porcupines, aardvarks, spotted genets and civets, in addition to the larger carnivores. Other antelopes are eland, impala and steenbok. One of the area's attractions is the game viewing walks and night drives on offer. Mountain biking within the reserve has become a popular adventure sport to combine game viewing with the excitement of approaching wild animals in the natural habitat. Armed game rangers oversee such excursions and add to the experience through their extensive knowledge of the bush. Tuli is one of the best places in southern Africa for ornithologists. Over 350 species of birds have been identified in the area, including rock thrushes, boulder chats, shrikes and cormorants. Different kinds of kingfishers dart into the streams and rivers, while waders stand in the shallows. Accessibility by road is difficult and the best options for the traveller by land are by tarred roads from South Africa, or by air to the newly surfaced Limpopo Valley Airfield. Accommodation is provided in luxury safari camps in both permanent and tented camps each designed to combine a luxury safari experience with a taste of the African bushveld.